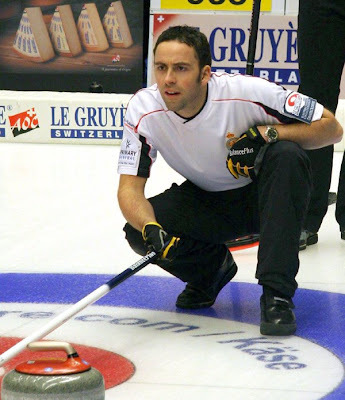 David Murdoch has been nominated by British Curling as Athlete of the Year. The citation says, "David Murdoch is 30 and lives in Lockerbie, Dumfriesshire. David comes from a family with a long tradition in curling, he has been curling for twenty years. David has had a great curling career. He won his first title as World Junior Champion in 1995, he got another gold the following year but had to settle for silver in 1998. He won the Scottish Men's Championship in 2003, 2005, 2006 and 2008. That took him to World Championships getting silver in 2005 and 2008, he won the gold medal in 2006. He has won the European Championships twice in 2003 and 2007. David competed at the Olympic Games in 2006 taking fourth spot, he's aiming for Gold in 2010. David said, 'I have had a fantastic year winning the European Championships in 2007 and getting silver at the World Championship in 2008. I am looking forward to competing at the Olympics in Vancouver 2010.'" The nominated athletes are invited to the BBC’s Sports Personality of the Year Award Ceremony. David won’t be able to attend, as he’ll be on his way home from the European Curling Championship just before traveling to Canada for the Continental Cup. from statistics from World and European Championships 2007/2008. The photo of David Murdoch in O'Vik is by Hugh Stewart. Well done David you deserve it!